Doug Jones, a Connecticut native, expresses his passion for music through his compositions and performances. He is also a music educator and has taught Instrumental Music in the Connecticut Public School system for the past 17 years as well as to his many private students.His career spans many years performing in different venues in the Northeast from the Hartford Jazz Festival to clubs in Newport, Manhattan and Boston as well as South America. His saxophone influences are David Sanborn, Grover Washington, Tom Scott, Bobby Keys and Edgar Winter. In addition to his own contemporary jazz group, Doug’s unique style of playing can also be heard with New England bands as well as blues recording artist Mark Nomad. ! ! His third and latest release, “Top Down” is getting positive reviews. Ronald Jackson from the Smooth Jazz Ride calls Top Down “A solid gold star effort.” Downbeat Magazine says “Tenor man Doug Jones has a fresh voice...” “Top Down” also features Doug playing Flute and Harmonica. Two instruments that he has been playing for many years but has never included on his previous releases “Shades Of Gray” and “Heart And Soul”. He credits his friend Ed Tankus from Blue Plate Radio, the premier internet jazz station for getting him to record his flute and harmonica. Doug was influenced by Roland Kirk and Ian Andersen on Flute and James Cotton and James Montgomery on Harmonica. His trips to perform in South America and his Venezuelan wife were influences in his song writing and can be heard on the Latin tracks “Bella Luna” and “One Last Dance”. “One Last Dance” is the first single to be released from Top Down. His second release, "Almost Summer", spent nine weeks on the Groove Jazz Music Top 30 music chart.! ! Doug is a consummate wind instrument artist. He is equally good and diverse whether playing the alto, soprano or tenor saxophone as well as the flute, harmonica and wind synthesizer. He also writes all of his own compositions. 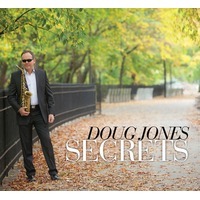 The Doug Jones Group has shared the stage with Tower of Power, Marion Meadows, Bob Baldwin and many others. His dog logo comes from his love of Great Danes, especially his rescue Dane Jack. His other Great Dane, Merlin, was the cover model on his CD “Shades Of Gray”.! Doug is currently working on his 4th CD with a release date in September, 2015.